Last Updated March 24th 2019: As i'm sure you already know, having a properly running toilet is extremely important! Not only will it save you money with water, but it will also make sure everything works properly in your time of need! If you want to be prepared for any broken piece or mechanism, then take a look at our toilet repair kit reviews. That being said, if you are noticing any water leakage on the floor, it could be from a broken toilet fill valve, but if it's around the ground it might be a broken toilet seal or a broken flange. Thankfully replacing the seal isn't super complicated, but to have a near permanent solution you need to select the best toilet seal of 2019! Now that you have seen very quickly some of my favorite picks, it's time to get into some more information about toilet seals. Below you will find all the information you might need when replacing toilet seals, along with my in-depth reviews of my favorites! When you are looking at toilet seals, there are a few different types available. 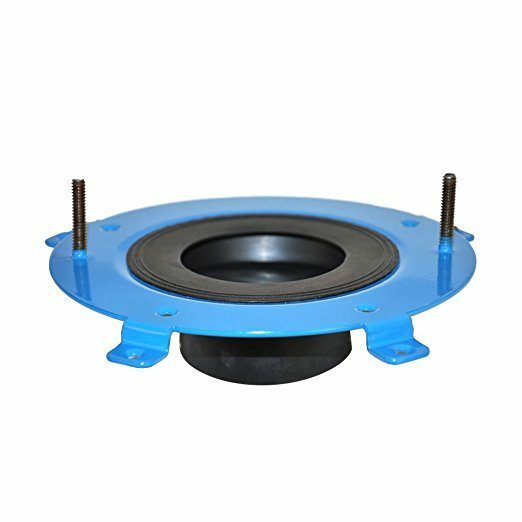 As you know, a toilet seal, is a ring that connects the toilets drain with the drain pipe on the ground or the flange. This connection is sealed together with either a wax solvent or a waxless creation. The more traditional option of the two, is to go with a waxed toilet seal. I'm not here to say that the waxed toilet seal is the best, because that's really up to the user, but this is the one the most people are familiar with. The waxed seals, as the name suggests, focuses on using a waxed ring to seal the toilet to the floor. This is usually done by peeling off a paper surrounding the wax, and then attaching the ring to the flange, and then attaching the bottom of the toilet to the seal. Some people also might find it easier to attach the seal to the bottom of the toilet, and then lift the toilet and seal into position with the flange. Overall, wax toilet seals are really known for their durability and how long they last! What is the Best Toilet Wax Seal? For those of you who prefer wax over waxless, I will save you sometime. 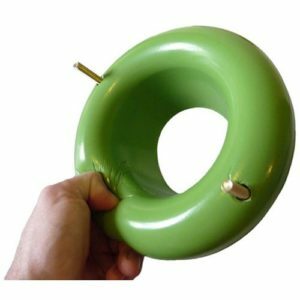 There are hundreds of waxed seals available on the market but the best waxed toilet seal is definitely the Next by Danco 10718x toilet seal. This seal is extremely easy to install, and the quality is extremely high. I have literally put this product on hundreds of toilets over the years, and it is still one of my favorites. This is one of my go to seals, and it lasts for years without issue. That being said, if you are prefer wax, then the Next by Danco is the way to go! The other option for toilet seals are waxless toilet seals. These are newer than waxed seals, and some think they are going to become the new standard! Wax free toilet seals are generally made of rubber or another suction type material. These rings are placed on the bottom of the toilet, and then placed on top of the flange and then screwed into place. These new seals are designed to be completely leak proof and are designed to fit any drain or any toilet. Along with this, there is no wax cleanup if you have to replace or install a seal! I generally prefer wax free toilet seals because of easier installation and easy clean up. Along with this, I think the overall durability is just about the same, so you don't have to worry about that! What Are the Best Toilet Seals? That being said, there are quite a few different seals available on the market, so it might be difficult to find the best one. Thankfully, I have been there, and I have tried quite a few different pieces, so I have written a few reviews to help you select a seal that will be right for you! Below you will find reviews for both Waxless toilet rings and waxed toilet rings. When people think of waxless toilet seals, generally the first company that pops into their minds is Fluidmaster. Fluidmaster was one of the first companies to start producing these waxless seals, and they really started to get people to believe that there was a better option than wax out there. The 7530P8 "Better Than Wax, WaxFree Toilet Bowl Gasket" is one of the main seals on the market, and it really is a great product. This was my first experience with waxless, and the installation is actually extremely simple, and has no mess. I personally use this seal all the time because I think it's the best toilet seal! Along with this, this seal is created to fit any toilet and any flange. As for the installation, I would argue that it's actually easier than a waxed seal installation. All you have to is fix the bolts to your flange, and then slide the seal ring on and then guide the toilet on top, and screw it all together! 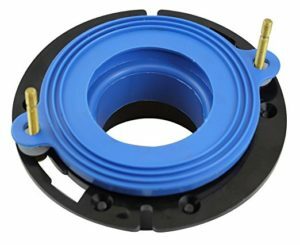 Along with easy installation, the durability of this FluidMaster seal is great! It comes with a 10 year warranty for a complete replacement because FluidMaster really stands behinds its products! Overall I definitely recommend the FluidMaster 7530P8 Waxless Flange Seal, it provides a quality solution that will stay with you for years to come. Along with this, it carries enough strength that you won't have any issues with leaking when you plunge or flush! 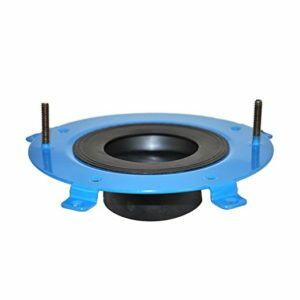 If you are looking for a new toilet seal, I would have to say that this Fluidmaster is better than wax in the ease of installation and the overall durability. Check Out Prices and Reviews on Amazon! Next on my list of the best toilet gasket seals, is the Next by Danco 10718x seal. This is a waxed seal, and it is one of the most reliable ones on the market! This Danco product is similar to the original wax seals because it actually uses wax, but it actually uses a newly developed type of wax that reduces the mess, and actually sticks 3x stronger than typical wax. This helps to ensure that the seal won't slip off and cause a leaking toilet. Along with this newly found stronger sticking formula, the Danco seal has the ability to be repositioned in case you don't line up the toilet and drain perfectly on the first go. This is great because it can be quite nerve-wracking knowing you have to get it right the very first time without a second chance, but thankfully with this you can readjust! 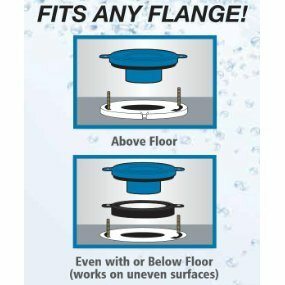 The Danco fits on toilets with flanges that are 1/2 inch above the floor through flanges that are 1 1/2 inches below the floor. This gives you a wide range of ability to use this seal, and I definitely suggest it if you are looking for the best wax toilet seal! When the difference between the floor and flange is less than 3/4 inch. (If the floor is too high, this ring has trouble creating a seal). Perfect when the floor is a little spongy or has some give to it. If there is movement present, a wax seal can break, but this ring provides constant suction to keep the seal in place. That being said, there are some customers that hail this seal as the perfect solution to using waxed seals, while other say they are going to continue with old faithful wax. I believe that the main disparity in these reviews really comes from the situation that the seal is being used for. For example, you will experience difficulties with this seal if your floor and flange are more than 3/4 inch apart because the ring can't make a permanent suction. Overall this is a unique toilet seal that in certain situations can be better and easier to use than a wax seal. The installation is extremely easy and removes much of the guesswork that wax seals provide. That being said, if you are fed up with removing wax, or are an amateur that is worried about aligning their toilet right, then maybe you should give the Sani Seal waxless toilet seal a try! After doing this Sani Seal review, it makes you wonder if you'll ever go back to wax seals again! Now that you have seen all sorts of great toilet rings and seals, it's time to make sure you find the right size for your toilet. As mentioned before, there are some seals like the ones mentioned above that are designed to fit nearly any flange, so with these you won't have to worry as much about sizing. But if you are looking at options that are size specific then have no worries! Turn your toilet on its side. From here take a tape measurer and take the diameter (Across) of the bottom most part of the bowl. Write this measurement down, this is your diameter measurement. Finding thickness: Now that we have found the diameter measurements, you also need to be aware of the thickness. Certain rings come in standard thickness and double thickness. If your toilet is fitted below the floor then you will need double thickness to make sure it fits even with the floor. Now that you have seen some reviews on great seal rings, and you know your toilet size and thickness, it's time to get to replacing the seal! Below you will find step by step instructions on how to replace the toilet seal easily! Shut off the water supply, flush the toilet once or twice to empty the bowl. Use a paper towel to mop up any remaining water. Remove the nuts and bolts that connect the toilet to the floor. Disconnect the water supply line to the toilet. Gently rock the toilet back and forth to help break the caulk and previous seal to the floor. Make sure you grab the bowl not the tank while doing this, because if you only grip the tank you risk breaking the porcelain. Now that the toilet is removed from the floor, remove the remains of the old seal so you have a clear surface for the next seal. Remove the new seal from the plastic wrapper, and place it on top of the flange with the rounded side facing up. Make sure the bolts are in the correct positions and that the seal is centered directly over the hole. Place the toilet onto the seal, keeping it centered and leveled correctly. Don't attach the toilet nuts back yet. Sit on the toilet to help compress the seal and allow it to suction and create the seal. Ensure that the toilet is level. Attach the toilet nuts by hand to avoid over turning and cracking the toilet bowl. Reattach the water supply line. Flush the toilet, check for any water leaks on the base of the floor. Once confirmed that it is leak free, move on to the next step. If needed, you can apply silicon caulk to firmly attach the bowl to the floor, but this isn't always necessary depending on the seal. In the end of the day, when you are trying to find the best toilet seal, a lot of comes up to personal preference. I tend to stick towards the newer waxless toilet seals just because I think the installation is a little bit easier. But in the end of the day, no matter if you choose wax or waxless, as long as you choose from a reputable seller, you are going to get a quality product that will last you quite a few years! That being said, if you have found that your toilet is constantly running, then make sure you have a quality toilet flapper.